According to recent the World Health Organization reports, lung cancer has become the most common type of malignancy and the leading cause of death from cancer; approximately 19.4% of cancer deaths per annum. Lung cancer can be differentiated by histology, with the most common type being adenocarcinoma, followed by squamous cell carcinoma, small cell carcinoma, large cell carcinoma, and bronchial carcinoid. Lung cancer frequently metastasizes to the adrenals, liver, brain, contralateral lung, and bones. Although cutaneous metastases from the lung are rare, it must be ruled out in patients with suspicious skin lesions, smoking history, or lung cancer. 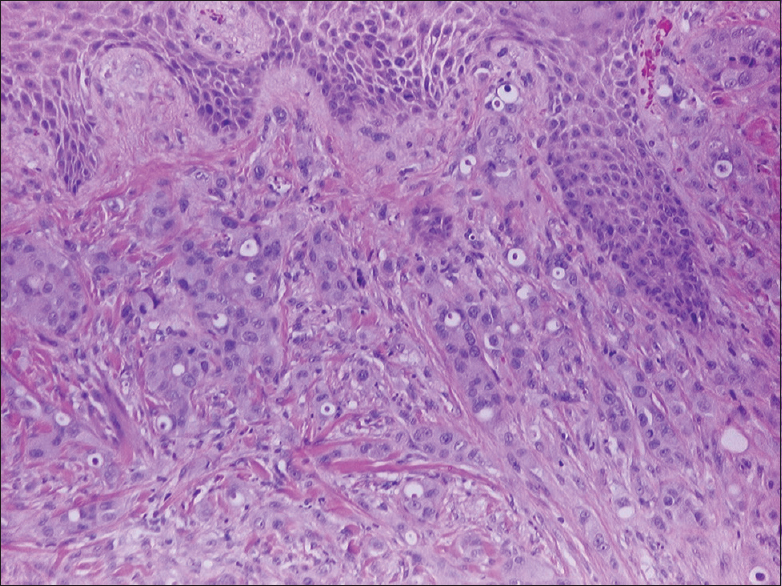 Discussed in multiple case reports, all histological types of lung cancer may metastasize to the skin, and clinical presentation of skin lesions are variable. 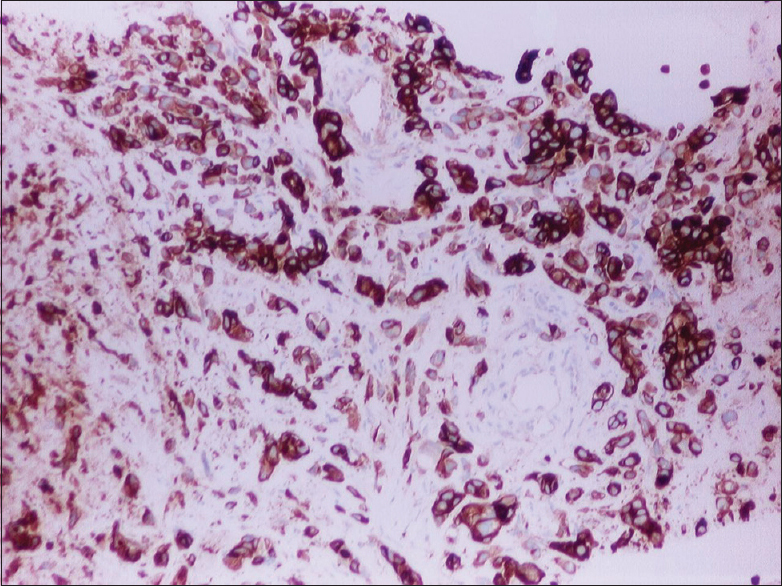 We present an unfortunate case of lung adenocarcinoma with skin metastasis, which was simultaneously diagnosed during the same hospitalization. 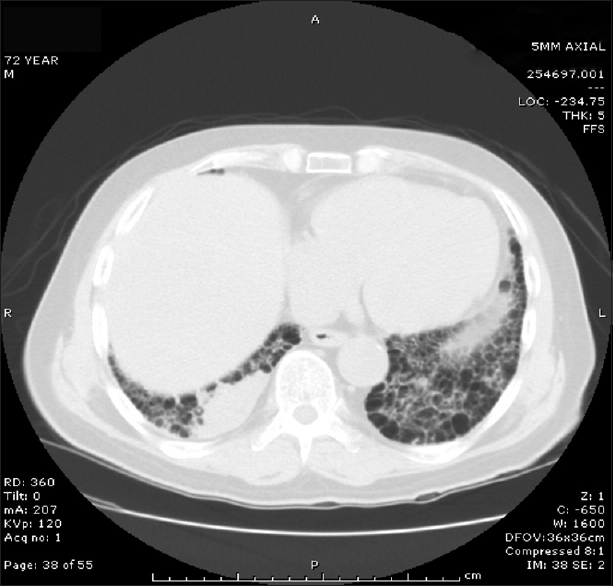 A 72-year-old hispanic male with a past medical history of pulmonary fibrosis controlled on oral steroids and home oxygen therapy, hypertension, diabetes mellitus, and no prior smoking history presented to the emergency department for progressive dyspnea over three weeks. He reported having cough that is productive of yellow sputum with no hemoptysis, associated with fever, night sweats, and six-pound weight loss over one week prior to the admission. In addition, the patient reported having a rapidly growing scalp lesion over two months with accompanying pain but no pruritus or discharge. He denied exposure to smoke or tuberculosis. On physical examination, vital signs indicated a temperature of 96.8°F, blood pressure of 153/87, heart rate of 82, respiratory rate of 22, and oxygen saturation of 86% on room air. On head examination, there was a large, ulcerative, well-circumscribed lesion, measuring 2.5 cm in diameter on the right parietal scalp with no cervical lymphadenopathy. On chest examination, he had fine bilateral diffuse crackles. The remainder of the exam was normal. Diagnostic laboratory values showed a leukocytosis with a white blood count of 23,200 Cells/mcL, hemoglobin of 12.3 g/dL, platelets of 211,000/mcL, blood urea nitrogen of 17 mg/dL, and creatinine of 0.8 mg/dL. Arterial blood gas on 21% FiO2 showed pH of 7.44, PO2 of 51, and PCO2 of 39, indicating a gradient of 50 mmHg. 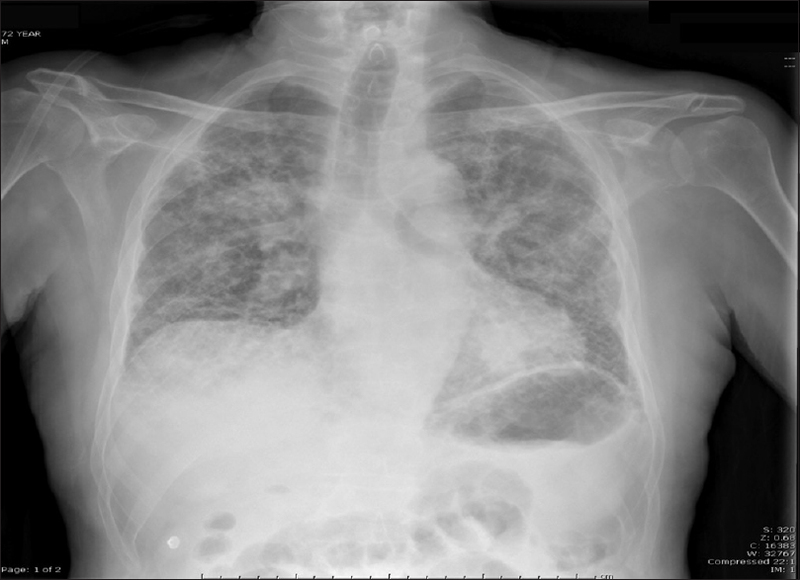 A chest X-ray showed bilateral interstitial infiltrates [Figure 1]. The patient was admitted to the medical floor, started on intravenous corticosteroids, oxygen, and nebulized treatments with symptomatic improvement. Initial workup included an echocardiogram showing severe pulmonary hypertension and a computed tomography (CT) scan of the chest showing diffuse fibrotic changes bilaterally with multiple densities of different diameters [Figure 2] and [Figure 3]. For further evaluation, a CT-guided biopsy of the lung revealed a poorly differentiated malignant neoplasm with foci of necrosis; immunohistochemical stains indicated adenocarcinoma [Figure 4] and [Figure 5]. Genotype testing was negative for epidermal growth factor (EGFR) mutation, RAS mutation, and alk translocation. Excision of the right scalp lesion was performed, and the pathology revealed poorly differentiated malignant neoplasm favoring adenocarcinoma, as confirmed by immunohistochemical stains [Figure 6] and [Figure 7]. During his hospital stay, the patient developed severe hypoxic respiratory failure requiring intubation and transfer to the intensive care unit. The etiology of his acute decompensation was determined to be septic shock secondary to healthcare associated pneumonia; hence, the patient was started on vasopressors and intravenous antibiotics. With the acute change of clinical status, prognosis was poor; his condition deteriorated and he expired after 2 weeks of hospitalization. As demonstrated in this case, cutaneous metastases from the lungs are rare but must be ruled out in patients with suspicious skin lesions, history of lung carcinoma, or tobacco exposure. Our patient had a history of pulmonary fibrosis with no history of smoking, and had a skin lesion as the first presentation for an underlying undiagnosed lung adenocarcinoma. The percentage of patients with lung cancer that develop cutaneous metastases ranges from 1 to 12%, with an overall incidence of 5.3% for all cancers., The most common sites for cutaneous metastases are the scalp, head, neck, and chest, with the most common histological diagnosis being adenocarcinoma. Among other internal neoplasms, lung cancer is the fastest to metastasize to the skin after initial diagnosis, with a mean time of 5.75 months. In 20–60% of reported cases, the skin lesions may present before or concurrently with the diagnosis of the primary tumor. Our patient reported a scalp lesion that grew over a 2 months period, simultaneous with the first occurrence of his pulmonary complaints. Cutaneous metastases from lung cancer do not have a characteristic presentation; skin lesions are often described as nodular, mobile, or fixed, indurated, and painless. Less commonly, these lesions present as zosteriform, bullous, papulosquamous, plaque-like, ulcerated, vascular with telangiectasias, erysipelas-like, or scarring alopecia on the scalp., Histologically, cutaneous metastases from the lung are frequently poorly differentiated. Diagnosis is often based on clinical information; however, histology, immunohistochemistry, and electron microscopy are utilized for gold standard confirmation. 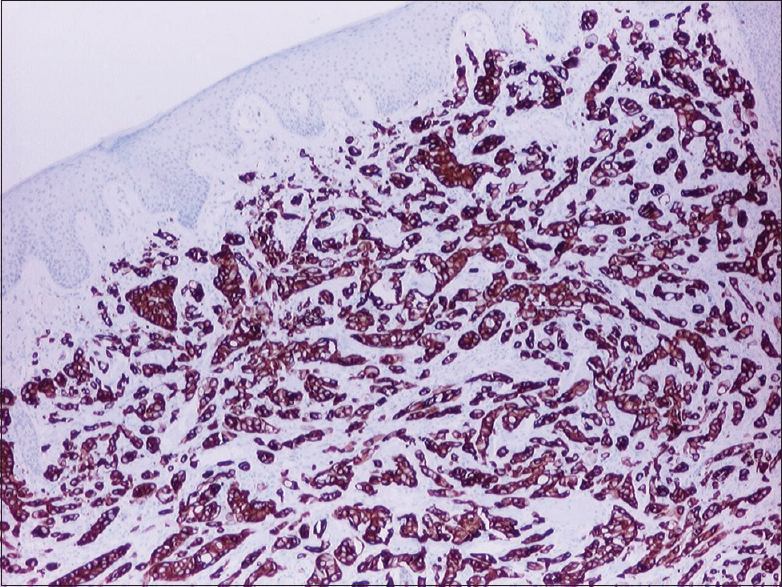 Immunohistochemical markers that may be useful for diagnosis are antithyroid transcription factor, cytokeratin 7 (CK-7), and CK-20., For our diagnosis, lung specimen and subepidermal specimen were stained with CK-7, which is specific to primary lung adenocarcinoma. 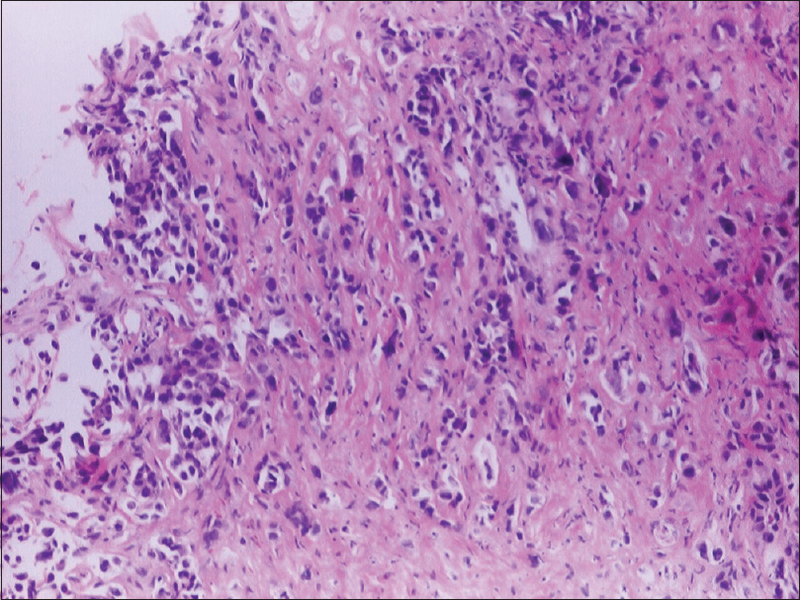 If the histology of the primary and metastatic lesions is similar, the diagnosis is confirmed. Treatment of solitary cutaneous metastases usually includes surgical resection combined with adjunct chemotherapy. Other treatments include radiotherapy, cryotherapy, laser, or radiofrequency ablation or interferon alpha injections. Usually, cutaneous metastases indicate a progression of the malignancy and poor prognosis. Other poor prognostic indicators include small-cell primary lung tumors (nonresectable), multiple metastatic cutaneous lesions, or other distant metastases. The average survival time after diagnosis of cutaneous metastasis is approximately 5 to 6 months, with few patients living longer than 1 year. Brambilla E, Travis WD. Lung cancer. In: World Cancer Report, Stewart BW, Wild CP (Eds), World Health Organization: Lyon; 2014. Kamble R, Kumar L, Kochupillai V, Sharma A, Sandhoo MS, Mohanti BK. Cutaneous metastases of lung cancer. Postgrad Med J 1995;71:741-3. Terashima T, Kanazawa M. Lung Cancer with Skin Metastasis. Chest 1994;106:1448-50. Marcoval J, Moreno A, Peyrí J. Cutaneous infiltration by cancer. J Am Acad Dermatol 2007;57:577-80. Wong CY, Helm MA, Kalb RE, Helm TM, Zeitouni NC. The presentation, pathology and current management strategies of cutaneous metastasis. N Am J Med Sci 2013;5:499-504. Su YC, Hsu YC, Chai CY. Role of TTF-1, CK20 and CK7 immunochemistry for diagnosis of primary and secondary lung adenocarcinoma. Kaohsiung J Med Sci 2006;22:14-9. Molina Garrido MJ, Guillen Ponce C, Soto Martinez JL, Martinez Y Sevila C, Carrato Mena A. Cutaneous metastasis of lung cancer. Clin Transl Oncol 2006;8:330-3. Leong SP, Gershenwald JE, Soong SJ, Schadendorf D, Tarhini AA, Agarwala S, et al. Cutaneous melanoma: A model to study cancer metastasis. J Surg Oncol 2011;103:538-49. Dhambri S, Zendah I, Ayadi-Kaddour A, Adouni O, El Mezni F. Cutaneous metastasis of lung carcinoma: A retrospective study of 12 cases. J Eur Acad Dermatol Venereol 2011;25:722-6. Ambrogi V, Nofroni I, Tonini G, Mineo TC. 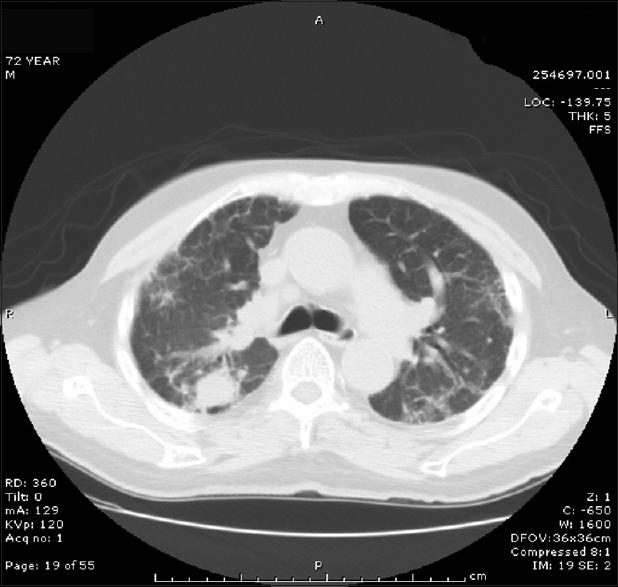 Skin metastases in lung cancer: Analysis of a 10-year experience. Oncol Rep 2001;8:57-61.